Chang Tong Chen has a lot to be thankful for. About $5 million worth. 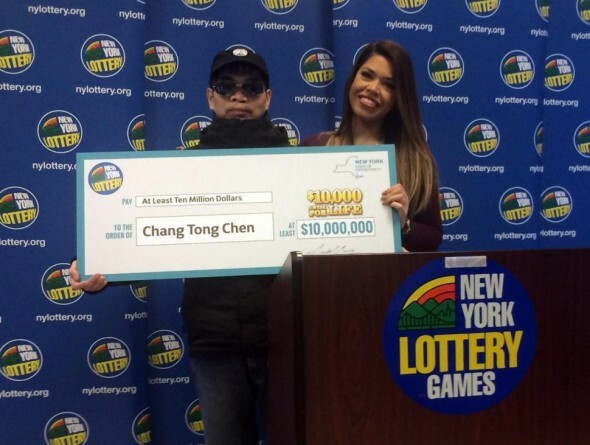 Chen, 51, was the lucky winner of the state's $10,000 a week For Life scratch off game after buying a game card in Queens last month, lottery officials announced Tuesday. Chen, a recently retired chef, kicked off the holiday season by choosing the $10 million lump sum option, which netted him more than $5 million after taxes. He bought the first $10,000 A Week For Life ticket because the ticket number was "8," his lucky number. But it wasn't so lucky. So he decided to by the next ticket number "7" because that is his son's lucky number. "I felt like I was going to win," said. Chen said he plans to buy a house in Flushing and take some vacations.